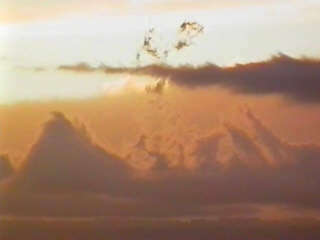 26th December 1998 - Convecting strato-form clouds. The day before the Sydney - Hobart yacht tragedy. The Illawarra escarpment here is clothed in layers of stratus, there are thunderstorms about 50km to the NW but weakening as they approach. However as one of the cells gets nearer the stratus banks suddenly start lifting vertically. 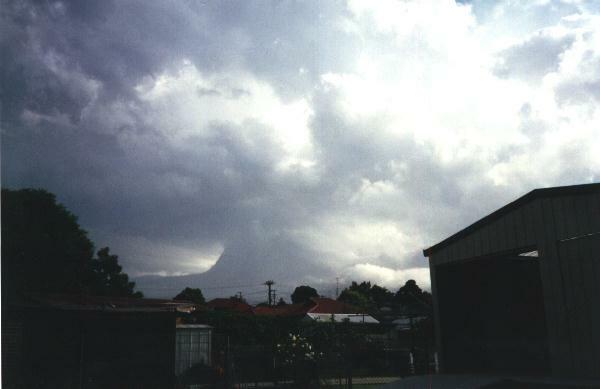 26th February 1997 - A rich morning for middle layer clouds. These three shots were taken within 30 minutes of each other. 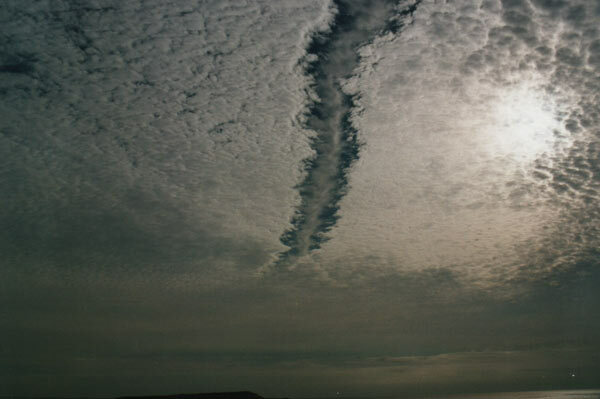 The first shows a layer of Altocumulus with a visible rip through it. Unless somebody has a better explanation, I can only presume a plane has passed through it. 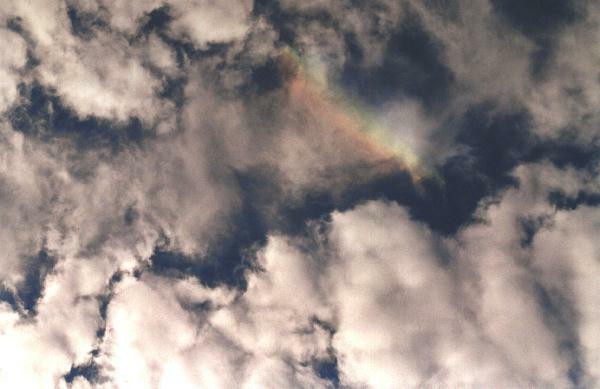 The second photo is a close up of part of the rip that was showing what is possibly a circumzenith arc. The last photo shows a clear circular hole in the Altocumulus deck, perhaps from descending air. Thanks to Mark at http://members.tripod.com/~regenbogen/indexe.htm suggesting the identification of the arc. 23rd March 1997 - This photo was taken by a thoughtful work colleague. I was on a storm chase at the time, about 50 kms to the west of this scene. I honestly don't exactly know what sort of storm feature this photo shows. Was it outflow ? 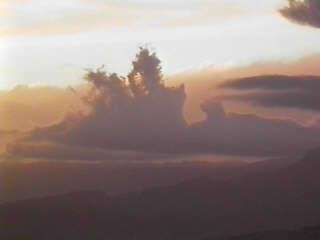 Later in the day a funnel cloud was observed from another storm. January 1997. In very humid conditions with a little instability, the steam from the Port Kembla Coke ovens has rapidly plumed into Cumulus. There was other cumulus around that day, therefore the coke ovens was aiding rather than creating the cumulus.